Muslin would help make a wonderful summer quilt out of this pattern. Great idea Jane. I found my rex tool but the trirex tool has gone absent with out leave......which is why I've never used it, lol. Jane, that navy is so dark, I would have taken it for black if you hadn't mentioned it. Your blocks look great! Thanks, Joe's mom. I'm really having fun with this block. I'm also using the Tri part of the Tri Recs ruler set. Working well for me. I am also going to join in. 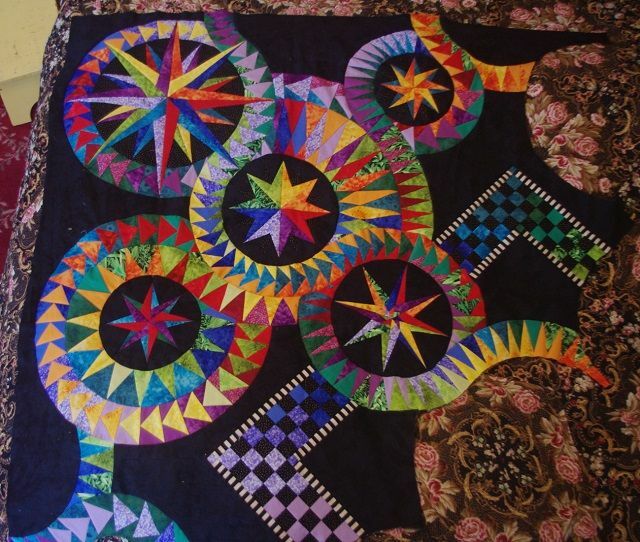 Loved this quilt as soon as I saw it on the board. I started working on sewing up my neutrals, and figured I had about half what I needed. 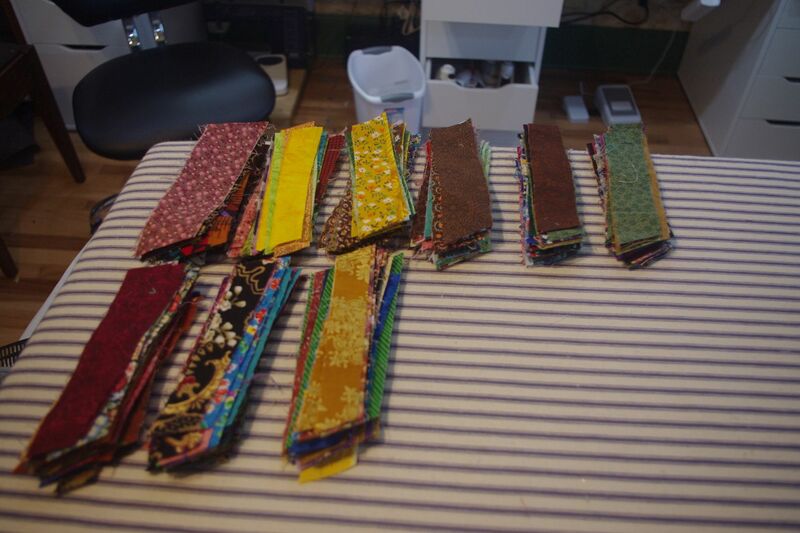 So I've been digging out some of my 1.5" strips to use, and also sewing up all the pieces that were too short on their own. I'm very excited to be using up scraps. That was a main goal for this year. 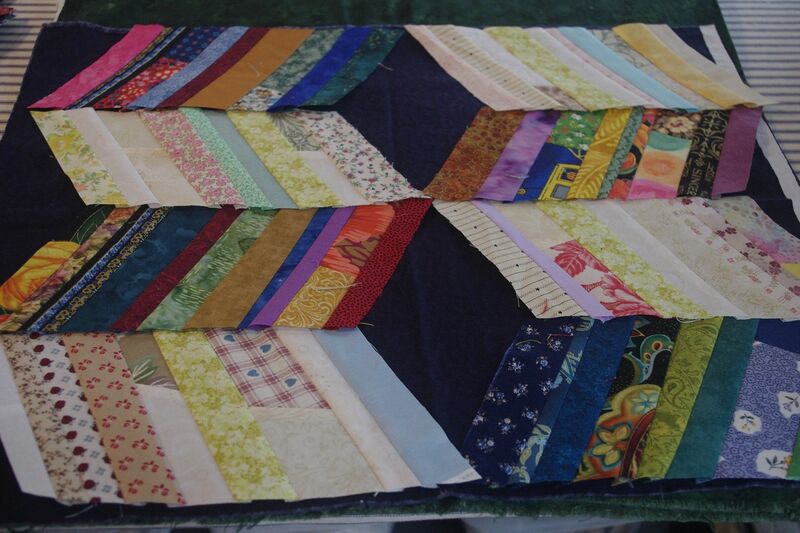 Can anyone think of a way to do this as a "Quilt As You Go" without sashing? Any sashing would get in the way of the visual effect of the boxes. What if I do the piecing on the batting only with the batting 1/4" smaller all the way around? Then put the backing on after. If there a way to do this? Since this pattern can be assembled in vertical sections that are about 10" wide, would that work for QAYG? 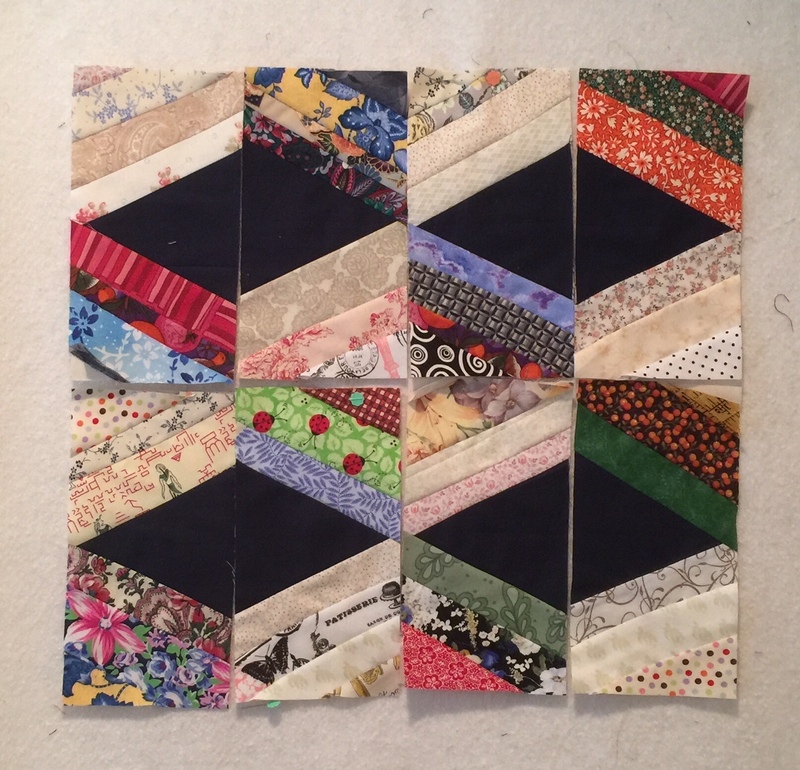 So you'd be quilting a 10" by length of quilt strip, then attaching the next 10" wide section and quilt that and work your way across. Layer the foundation for your block, your batting (cut 1/4” shorter on all sides),and the backing. Baste around all edges, doing your best to keep to the edge of the batting. You want that inside the basting. Add the triangle and strips to the block. Stop stitching and backstitch at the baste line. 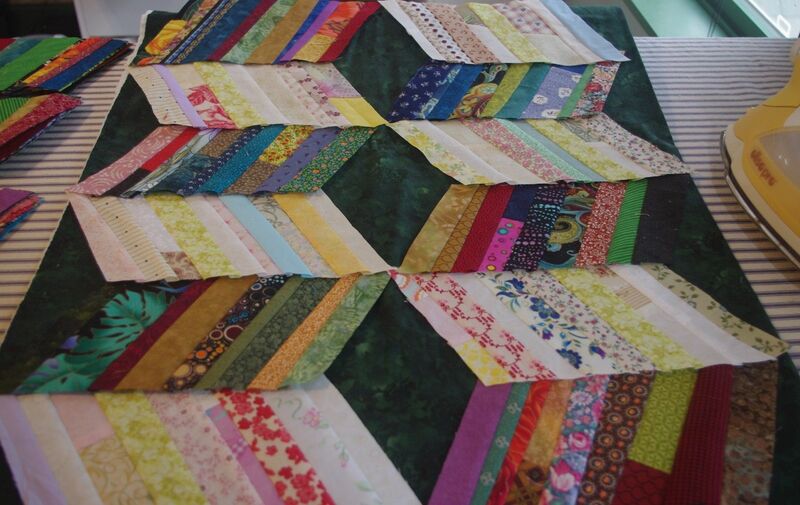 Put your blocks together, right sides of the quilt top facing. Keep the backing out of the way. You don’t want it in the seam, Sew the blocks only with a normal 1/4”. You should just catch the ends of the stitching you used to add the strings. Iron the seam open, being careful not to melt the batting. Yes, I have melted it. Turn over to the backing side. Iron under 1/4” on one side of the backing. Pin the seam and hand sew it. I don’t know how to make a video tutorial, but there are many on the net. Just Google “quilt as you go without sashing”. If you can wait a little to start, I can test this after April 1st—at least make two blocks and join them to see if the theory bears out. Last edited by Krisb; 03-23-2018 at 05:20 PM. You could do qayg with the sashing strips on the back instead of the top- that would make an interesting back and not change the visual appeal of the front. I think that is a great idea- I might try it out- I have a large bag of batting scraps I could use up....bonus all around. I've got my light strings all sewn and trimmed. I have 95 of them. Now on to the darks. 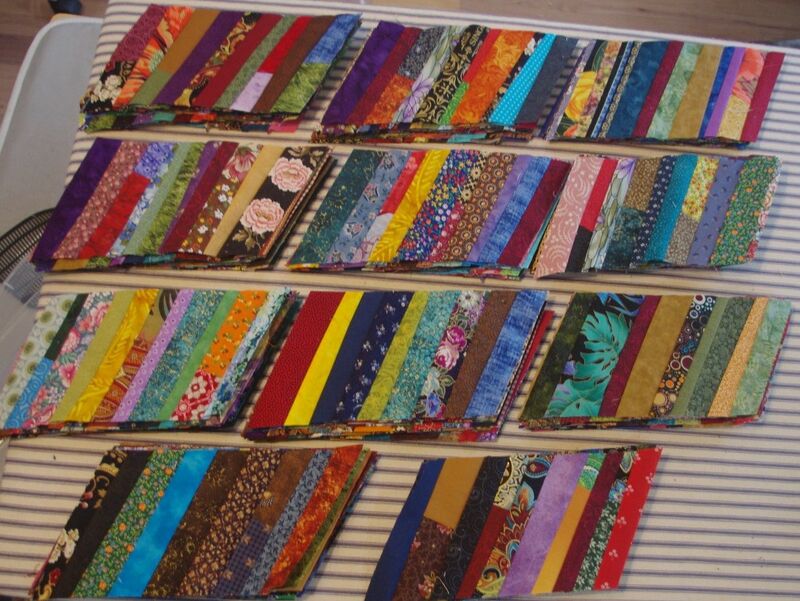 I know I need about 9 strips per section - so I'm aiming for 1,000 and then I'll start sewing. I'm laying them out 5 layers and rough cutting them. 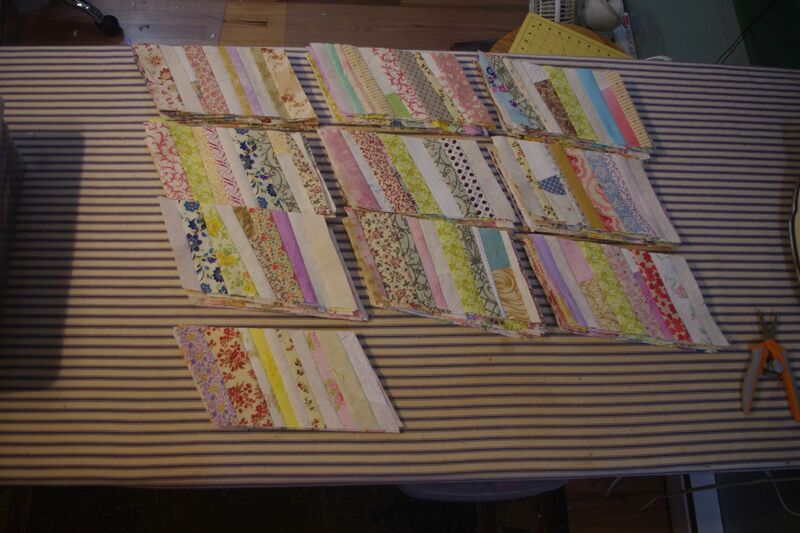 The shorter pieces are going in the tote and I'll sew them together to make strips long enough to cut. Once I have the strings done, I'll cut the triangles and then sew them into crosswise strips. At least the only thing that has to match is the triangle when sewing the strips together. I'm so, so glad to be using up the piles of strings! Interesting construction method Macybaby. I am trying the paper pieced method being more careful on placing my center triangle. I already threw one in the trash. I have a major PP quilt in the works and didn't want to do any other PP right now. I'm about half done, and I work on it until I'm sick of PP, then do something else for a few weeks. Been working on it off and on (more off I think) since the start of the year. The great thing with this pattern, you can get a little wonky with the strings and it won't matter, as long as the cut angles are correct. I've certainly been there! I use a dab of glue to keep my triangle on my muslin rectangle. Let us know if this works. I'm interested in how it would be done. Where are you in Northern Mich? I used to vacation as a child at Lake Chicaugon. To save space, I deleted the photos for this comment. I've been interested in this string quilt but wasn't happy with the method. Now that you've created this method, think I'll do it. I have stopped for now. I am finding that some of my triangle bases are not matching up. Maybe it is my own fault as I wanted to see if the 60 degree ruler would work for my triangle. Perhaps the skinnier triangle would be less noticable if they didn't match? I also had a few edge stitches pull out when I removed the paper even though I use a small stitch length. Here are 8 of my pieces sewn into pairs, the seams pressed open and side by side on the table. 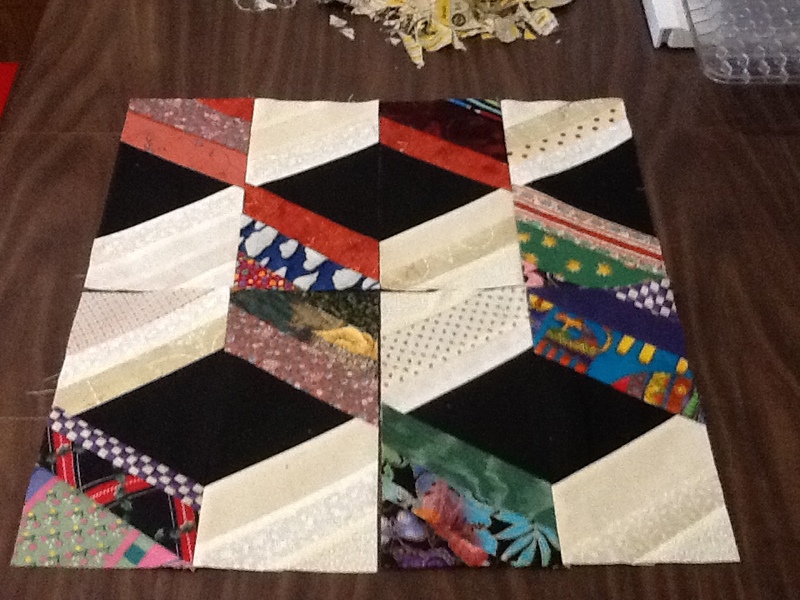 The one square with the Lauel Birch fabric is about 1/4 inch out on the black base. Macybaby's method may work better then paper piecing. I've got my dark string sewn. 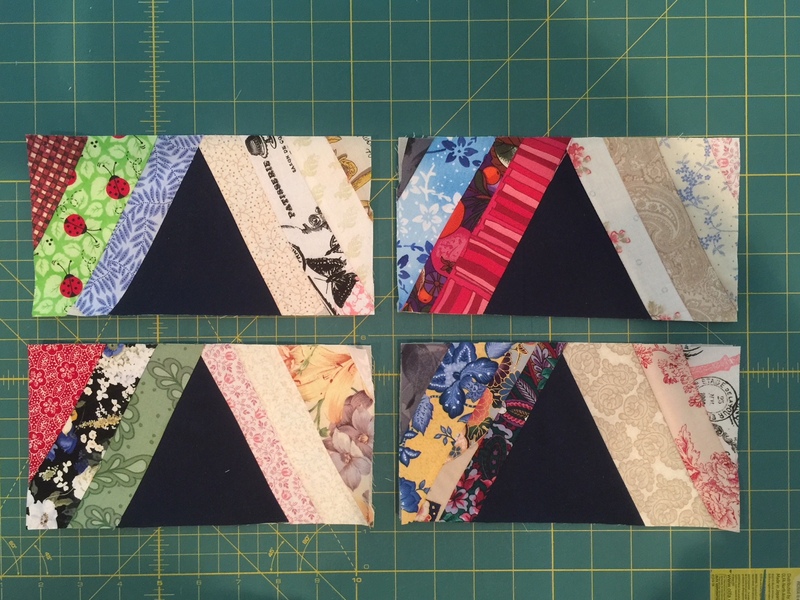 I was considering navy for the triangles, but I only have a small amount in my stash. So I found some green I've got lots of, and think I like that better anyway. I'll use it for a border and binding also. I'm planning on ending with the green triangles to add more interest to the edges. After that, you can sew from the top side as the rest of the seams don't need to be anywhere specific. I'll be finding out soon if the way I'm doing it works well for lining up the triangles. I'm using my Tri Recs ruler quilt a bit for keeping the strips correct. As I sew, I'm going to press to the dark strings and press away from the light strings so I can nest the seams when I sew the strips together. I think I would have done the same if PP, which means I'd have started with one light string as the base, then sewed the triangle so the triangle folds back, then sew the first dark strip. After that, it won't matter. And based on my experience PP, I'd have also cut my triangles oversized a bit. I hate not having "wiggle room" for PP. BTW - this is my current PP project that I need to get back to soon. Macybaby your other PP is gorgeous! I folded my papers and carefully placed the point on the fold. Used a 1/4 inch seam and still have them off a bit. 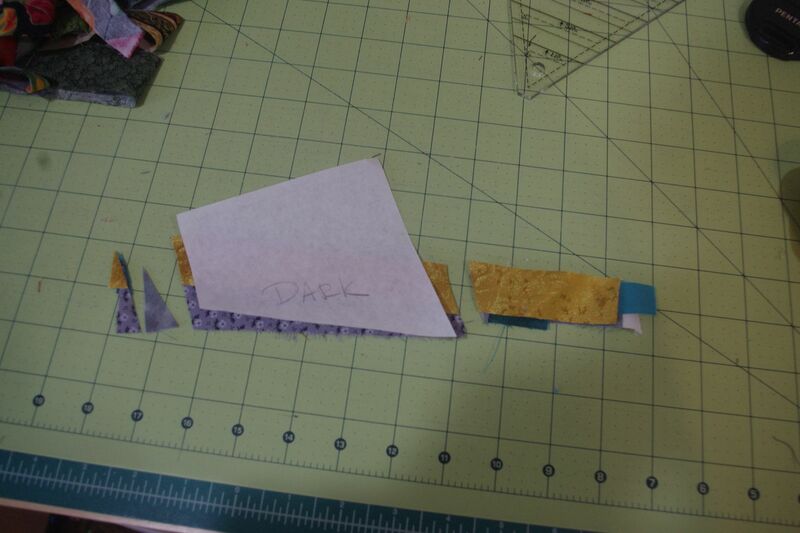 I think if I do any more, I will piece the strips right to the triangle without the paper and then trim to size. We will see how that goes. I was curious to see if the method I'm using would come together nicely - so I did 6 rows. Mine should end up 80x88 without border. So that means 14 more rows to go. I probably won't get to it for a while now. I have the top folded back, it starts at the triangles. I did use the green, but it didn't photo well (dark gloomy day here). I'm finding that my light sections are too busy and think I'll have to quiet them down as I make more blocks.